11. You Won't See Me I have to say Anne Murray did it better. The ideas are there, the execution just doesn't come off and becomes a trudge in the "Time after time..." sections. Someone tell @ewe2 that I've stopped talking to them. @Here Comes The Sun , I am curious as to why you have Think For Yourself as #3 in the ranking of the songs on this album and have it (along with Girl) as your favorite songs on the album. How do you distinguish between "ranking" and "favorite"? Making that distinction (best vs favorite) is an age-old question on the forum. This is easy. The original UK version, as is! 3) "If I Needed Someone " -- George Harrison emerges as a real songwriter, able to stand along side Lennon & McCartney -- great vocal harmonies (especially Lennon's -- he very nearly steals this song) -- and that chiming 12-string Rick of George's -- sometimes I think this is actually the best song on the album, but today it's #3. Folk are strange. 'Run For Your Life ', 'What Goes On ' and 'You Won't See Me ' coming near the bottom of any ranking is a travesty. 'You Won't See Me ' is my favourite Paul song on the album. And I have no idea what folk hear in 'Nowhere Man ' for it to be rated so highly. I've always found it to be monotonous, slow and overlong. Guess I'm the weird one. "Nowhere Man" -- once again, that Lennon voice draws me in every time, Paul & George's backing (especially George) -- the lustrous double-lead guitar solo and George's little sonic "ping" at the end -- beautiful song"
Different strokes -- one man's heaven is another man's hell. I hate mustard on hot dogs! Whatcha gonna do? 1. In My Life : Just a straight up masterpiece. Top of the Beatles catalog. 2. Nowhere Man : The vocal harmonies are out of this world. This song hits me like a bag of bricks. 3. Drive My Car : Catchy, fun and a great album opener. 4. Norwegian Wood : So fun to play on guitar! The sitar really makes the song. 5. If I Needed Someone : George's first excellent song. Nice little riff. 6. You Won't See Me : Ugh those background vocals are crazy. This album has so many good harmonies. 7. I'm Looking Through You : Fun song, I like the little opening riff. 8. Wait : That percussion! 9. The Word : Catchy and fun. 10. Think For Yourself : The bassline is what makes it awesome. 11. Run For Your Life : Good song but the lyrics ruin it. 12. Michelle : Not to fond of this song but it's growing on me. 13. Girl : Not bad but defiantly not one of my favorites from John. 14. What Goes On : Cheesy and fun but out of place on the album. Awesome to Awesomer! was on Rubber Soul . I always thought that it was a single. Guess I know less about the Beatles than I thought. @ewe2 @IMDeWalrus - I don't run into references to Anne Murray very often, so it's unusual to have 2 in one week. Micky Dolenz (The Monkees drummer) tweeted this picture on Halloween. It appears these guys called themselves The Hollywood Vampires and spent most evenings drinking at clubs on the Sunset Strip. 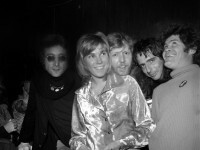 This picture was taken after an Anne Murray concert at The Troubadour on Thanksgiving 1973. Group includes John, Anne, Harry Nilsson, Alice Cooper & Micky. I think Ringo was part of the group as well, but appears to be missing in action that night. That's an interesting combination! The John/Harry is known but Alice and Mickey and Anne?! Nowhere Man - I am a little surprised I put this one in the top, but today I think this is where it belongs. Another day I might put any of the top 12 songs in the top. You Won't See Me - I like it, but it feels like it goes on for too long. Michelle - It's a pretty good song, but I think they should have worked on it longer. It sounds like they were in a hurry when they recorded it (same with You Won't See Me ). ah! after looking at these lists i see Michelle is being criminal underrated. Its one of Mccartney's bests songs in my opinion. It would probably place 2nd for me behind Girl, in my life, Norwegian Wood , and Nowhere Man tied for first.. Rubber Soul is so good. I've always felt that Nowhere Man goes on too long. I used to love You Wont See Me but over the last few months I've began to feel it's overly long too.